New for 2018, the VP9-B offers a US-type push button magazine release. 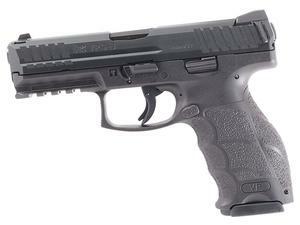 Derived from the P30, the VP9 is HK's newest striker fired pistol. The VP9 trigger offers a short, light take up with a solid break followed by a positive reset. Uses HK's ergonomic handgun grip design with 3 interchangeable backstraps and 6 side panels. The VP9 offers ambidextrous controls and uses a new push button magazine release. The push button model utilizes the same magazines from paddle type models. Weight (empty magazine) 26.56 oz. Trigger Pull (N) 5.4 lbs.